You may want to Google Cachimba before you go yelling her name out the backdoor - but look at that face! Totally worth it. 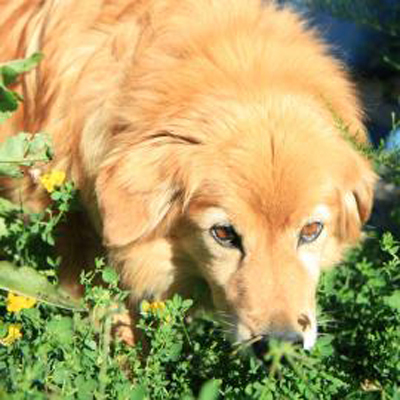 Cachimba, a beautiful 9-year-old Golden Retriever/mix, finds herself at Lollypop Farm because her owners were moving and couldn’t bring her along. Her thick, dense coat will require some care, but the payoff will be an even more beautiful dog when you’re finished. Our volunteer dog walkers tell us she’s very good on a leash, loves her treats, and is an all around great dog! You can take Cachimba home for just $75 during our Bark-to-School Adopt-a-Thon, today through Sunday, August 29th! Cachimba also qualifies for our Seniors-for-Seniors Adoption Program, so if you are 60 or older you can take her home for free. This sweet girl is eager to meet you! Brando, the cat from last week, is still available for adoption.